The Diva's Weekly Challenge #254: "Valentangle"
Gourdgeous in gold! I'm really pleased that we can add our own style and tangleate because I love doing these funny squashy gourdgeouses!! Shaded with Prismacolor Metallic gold and white pencils. 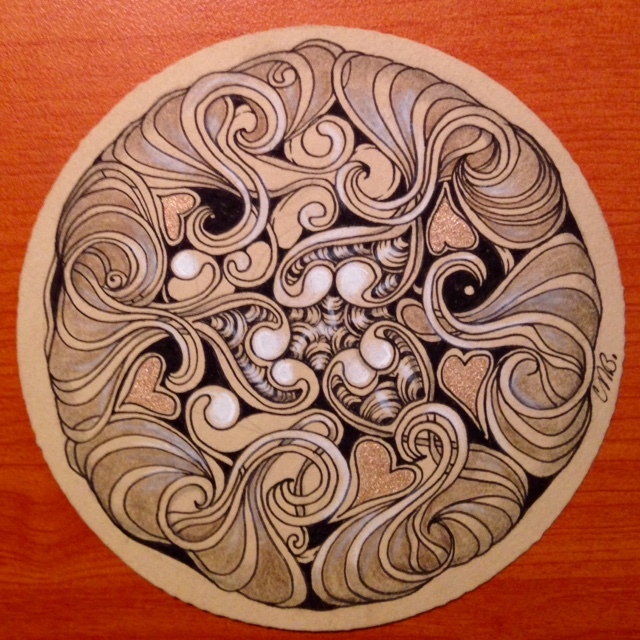 Hearts in gold - Gelly-Roll pen on Renaissance Zendala. The golden hearts are so nice in this Zendala. I want to learn how to link Tangles. You do it so effortlessly and beautifully. These gourdeous are so your style. I can see them becoming a staple for you. A lovely valendala! How golden is this tile! :) Love it, it's beautiful! Stunning! I love your elegant style. This is just yummy! love the gold and the tangling is beautifully done! Love the mandala! Beautifully done. Absolutely gorgeous and so precious! I love it!